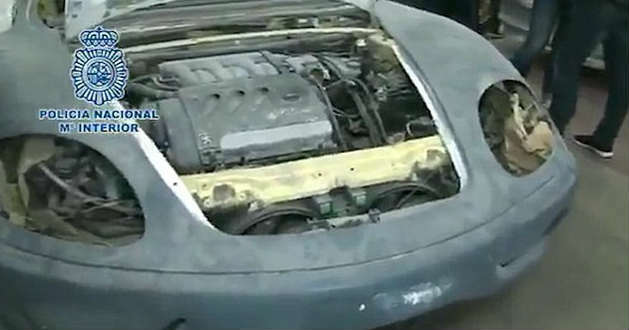 Spanish Police Discovers A Factory Making Counterfeit Cars! These Guys Built Ferrari & Lamborghini Kit Cars! If something is too good to be true, there is something weird about it. That is how we can describe this video that we are sharing today. It is a story about 3 people, who sold counterfeit cars in Spain! Not just any kind of cars, but Ferraris and Lamborghinis! According to reports, these guys had a kit car factory, where they were making Ferraris and Lamborghinis by molding the body kit to a Toyota. Selling kit cars isn`t illegal, however these guys made one crucial mistake that eventually led to their capture. They sold the kit cars for full price. Police got suspicious after the group tried to sell a car online for $44,000. Bear in mind, these guys were making Lamborghinis and Ferraris! Soon afterwards, they were arrested on the charge that they make and sell counterfeit cars. Their kit car factory was found and in it a total of 18 cars were found. Four fake Ferraris were completed, while another 14 were still in the construction process. Luckily, the kit car factory was closed down and the production was brought to an end. We feel sorry for whoever felled victim to this scheme. Anyways, watch the video below to see the counterfeit cars! On the other hand, the US cops got busted for doing the most ridiculous thing ever.